Indianapolis, IN - On the eve of the 30th Sunday after Pentecost, His Grace Bishop Longin arrived before Vespers in St. Nicholas Church in Indianapolis, Indiana. After the service, he extended a note of appreciation to the young and talented women and girls who regularly serve as cantors and then went to the parish home, where he was welcomed, as always, very cordially by the family of Priest Dragan Petrovic. The next morning, the church was crowded by people who wanted to see their Bishop and to celebrate the Church Slava. In addition to that, it was a family Slava for many, including the Bishop. This is how, actually, the church was dedicated to the great hierarch and wonderworker from Myra, for most of the Serbs who came here from Prizren a century ago and who founded this church community, celebrated him as their patron saint. During the Liturgy, adorned by inspiring chanting of the church choir and by the service of a guest priest from the OCA, Fr. Zachariah, His Grace delivered a sermon in three languages: English, Serbian and Russian, pointing out that our faith is declared and proved by our deeds and lives, and in this St. Nicholas should be a model to all of us. Preceded by the singing of the slava’s troparion and blessing of the bread and wheat, the festal procession followed, during which a newly built church pavilion was blessed. It was dedicated to the Most Holy Mother of God and adorned by her beautiful icon. After distributing the holy bread, His Grace awarded two stewards with special recognition for their outstanding contribution in the construction of the pavilion: Nicholas Babic, the Vice President of the Executive Board and Kum of the church slava for this year with his family, as well as Stanley Cvetkovich. Their names, actually, personify a great effort and love of the whole community and its leadership invested into this new building. The festal gathering continued in the social hall, where a meal was served by the untiring Kolo of the Serbian Sisters. The food reminded the bishop of his days of service in Dalmatia, and it showed once again why the sisters are the back bone and heart of this community. After the meal, Bishop Longin expressed his joy for being able to celebrate the Church Slava with his people. 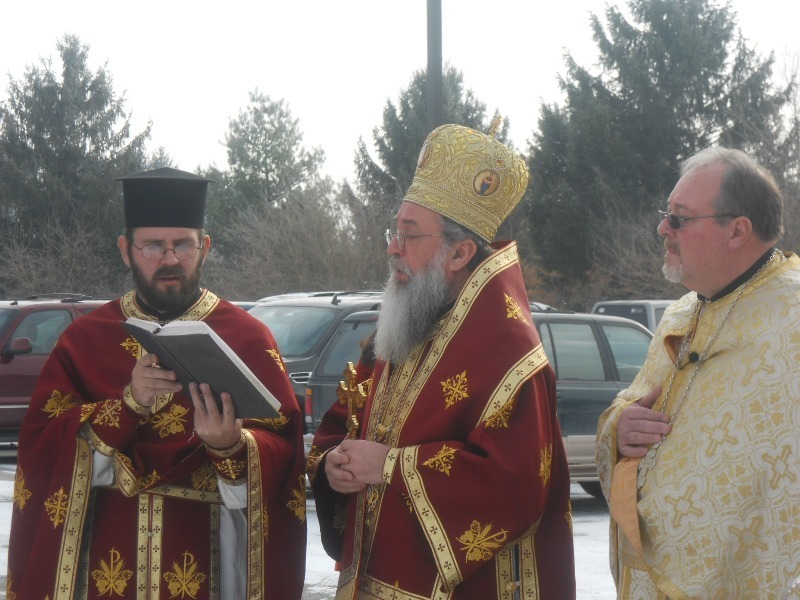 He thanked them for their warm hospitality and commended their keeping of the Serbian traditions, but also their openess for all other peoples, who constitute a significant part of this parish, and with whom they enjoy unity and brotherhood in the Holy Orthodox faith. Having given a blessing to all, the dearest guest and host returned to New Gracanica Monastery in Chicago to welcome his own Slava guests.